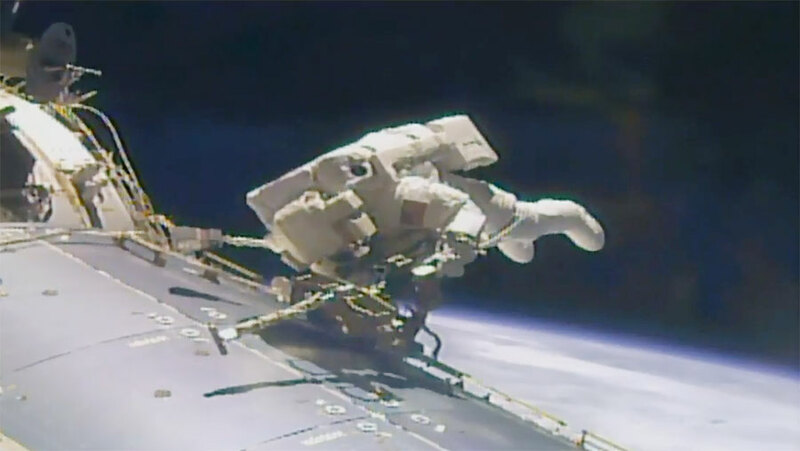 Astronaut Jack Fischer is tethered to the outside of the International Space Station during the 200th spacewalk to install and repair gear with astronaut Peggy Whitson. Expedition 51 Commander Peggy Whitson and Flight Engineer Jack Fischer of NASA concluded their spacewalk at 1:21 p.m. EDT. During the spacewalk, which lasted just over four hours, the two astronauts successfully replaced a large avionics box that supplies electricity and data connections to the science experiments. The astronauts also completed additional tasks to install a connector that will route data to the Alpha Magnetic Spectrometer, repair insulation at the connecting point of the Japanese robotic arm, and install a protective shield on the Pressurized Mating Adapter-3. This adapter will host a new international docking port for the arrival of commercial crew spacecraft. Spacewalkers have now spent a total of 1,247 hours and 55 minutes working outside the station during 200 spacewalks in support of assembly and maintenance of the orbiting laboratory. The first spacewalk in support of International Space Station assembly and maintenance was conducted on Dec. 7, 1998, by NASA astronauts Jerry Ross and Jim Newman during space shuttle Endeavour’s STS-88 mission. Astronauts completed attaching and outfitting of the first two components of the station, the Russian Zarya module and the U.S. Unity module. THX NASA for live feed. Now relay can look that is no every day job. And regards to Beggy and Jack for so cool work out there. Regards Juha kinnunen from Finland. Country of our hero Timothy “Tim” Lennart Kopra. Great work keep flying high. I think sometimes about the travel to Mars, as is planned in a little capsule. Why not build up a larger spacecraft in The space and when completed send it away by f.ex. Ion-propulsion. When I was young saw I a plan of a space craft like a large wheel rotation for made a naturally gravitation for the astronauts. This spacecraft had so be set in rotation around Mars and equipped with small landings craft ( 2 to 4) for landing on Mars. By a larger spaceship will it also be possible to bring more supply for the trip to and return from Mars. As it is now would I not as astronaut like siding “Jammed in” a chair for 2*9 month, as I have so a trip will last. This is a proud moment! I am thrilled! This is the “real” news that the public should herald! Ils nous disent au revoir. Very impressive. I also would like to act as a volunteer ever open. Hi my name is Alex White I’m 11 and I live in Perenjori, Western Australia and my class is looking at the international space station and I have some questions to ask. 1. Does time speed up in space? 2. Does anyone in the space station watch Star Wars and if so what is your favourite movie? 3. How many years of training does it take to go into space? 4. What time zone do you use in the space station? 5. How can you tell if it’s day or night in space? 6. Do you have T.V or YouTube in space? Thanks for listening and I hope you can answer my questions. P.S can you do bottle flips in space? 1. Time doesn’t change significantly aboard the space station. 2. We are sure the astronauts love science fiction movies. 3. The astronauts typically train for at least two years across the world to prepare for their space missions. 4. The crew sets their schedule to Greenwich Mean Time, or GMT. 5. The crew experiences 16 sunrises and sunsets each day. They wake up at 6 am GMT and go to bed at 10 pm GMT everyday. 6. The crew can watch movies in space. Thanks Mark. Are you up on the space station right now. How old do you have to be to start training and can you train in Australia? I wish! I am part of a team that publishes space station activities such as spacewalks, rocket launches, science experiments and other cool stuff to NASA websites and social media. If you want to be an astronaut study #STEM fields such Science, Technology, Engineering and Mathematics. Also, former astronaut Andy Thomas is from Australia and he became a U.S. citizen in December 1986 to become a NASA astronaut. Visit https://astronauts.nasa.gov/ to learn about the astronaut selection process. Hi I’m Aimee from Perenjori Primary School Western Australia.My class is learning about the I.S.S and so far we have watched 2 videos about the International Space Staition.I would like to ask how long have you been in space? Thanks for reapplying to my comment. Hi my name is Orlanda and I go to Perenjori Primary School. We have been watching some youtubes about the I.S.S. Hi I’m Sarai Papai. I live in Perenjori and I’m 8 years old. I live next to the park and after school go to the park and play with my friends. We are learning about the I.S.S in our class. Hi. I’m Jake and I’m from Perenjori, Western Australia. 1. How many parts of the I.S.S. got sent up into space? 2. Where are you above the world right now? We have our own class blog, just visit on perenjori.education.blogs or Miss Marshall and Mrs Cannon’s class blog 2016. What is the SpaceX Dragon? Did you see our class blog and did you like it? Sorry, we haven’t seen your blog yet. What is the link? Did you like the blog? Which bits did you like? In 5 weeks we are going to do a space expedition with robot’s called “Dash”. Hi I’m Lehyia I’m from Perenjori Primary School . The other students and I in Room 1 are learning about I.S.S and our theme is a Galaxy Far Far Away. Peggy and the crew, what inspired you to be an Astronaut? and how long have you been out in space ? Hello my name is Haranni and I am 8 years old. Do you like having no gravity? It can take astronauts a few days to adapt to living in gravity. However, you can do fun things in space that you can’t on Earth like watch your food float, play water ping-pong and do space flips. Hi my name is Georgia and in our class we have been studyingabout the International space station. We have watch two videos. When I was watching the video I wondered how do you tell the time by which country your from because I am from Australia? All space station crew members set their work schedule to Greenwich Mean Time, or GMT. Perenjori is 8 hours ahead of GMT (GMT +8). Hi my name is Justice and I am 8 years old. I live in Perenjori Western Australia. What is it like in up in space? When are you going to come back to Earth? Two space station crew members are due to return to Earth June 2. Then three more crew members will launch to the station July 28. The next crew to return home on Earth will land in September. Hi I am Tahlia I am 11 year old girl and I am a year 6 at Perenjori Primary School . In Room One we have been learning about I.S.S and it has inspired me to be an astronaut at the the I.S.S . Congratulations and study hard! The STEM fields (also known as Science, Technology, Engineering and Mathematics) are great subjects to study for future astronauts. The cameras available on the space station aren’t able to capture the detail that the Hubble Space Telescope or orbiting Mars satellites are capable of. Photographs of Mars from the station show little more than a bright dot. The crew members sometimes do astronomy studies but they primarily study how space affects humans possibly benefitting people on Earth and astronauts in space. Good question. The crew removes all watches and jewelry before interacting with the spacesuits as part of the procedure. This is a standard safety precaution. Wow this is amazing. My daughter just loves everything related with space and astronauts, when I first showed her the live stream with a spacewalk she could’t stop watching it.